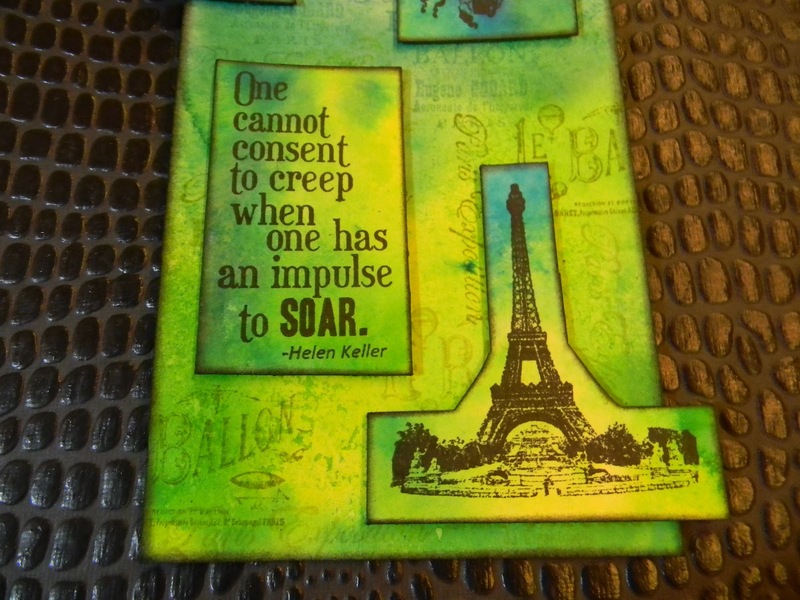 It's time for the Artistic Outpost Design Team Blog Hop!!! Our challenge was to use the Paris Exposition stamp set. I decided to break away from my regular products and go bright with Dyan's Dylusions. I am so thrilled I did. 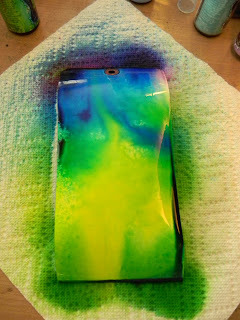 I felt like I was back in grade school, in art class, and just playing and having fun! Just seeing the bright colors makes you happy and carefree...sounds silly I know, but I'm hooked. I wasn't even sure that this stamp set could go bright instead of vintage chic looking, but I think it looks great. I think you can take anything vintage and classy and mix it up with trendier things. It adds more variety and interest, in my opinion...that's why they call it...well, Art. It's like pairing a tuxedo jacket with a great pair of vintage jeans and some fabulous leopard heels. It just works, and the other Tim (Gunn) would love it! It's a new way to 'soar'!!! See my mini tutorial below to make this fun Dylusions background. Don't forget to visit all the other AO Design Team's Blogs...talk about some gorgeous creations!!! I selected my spray colors and prepped my service. It's important to have everything handy so you can work fast. 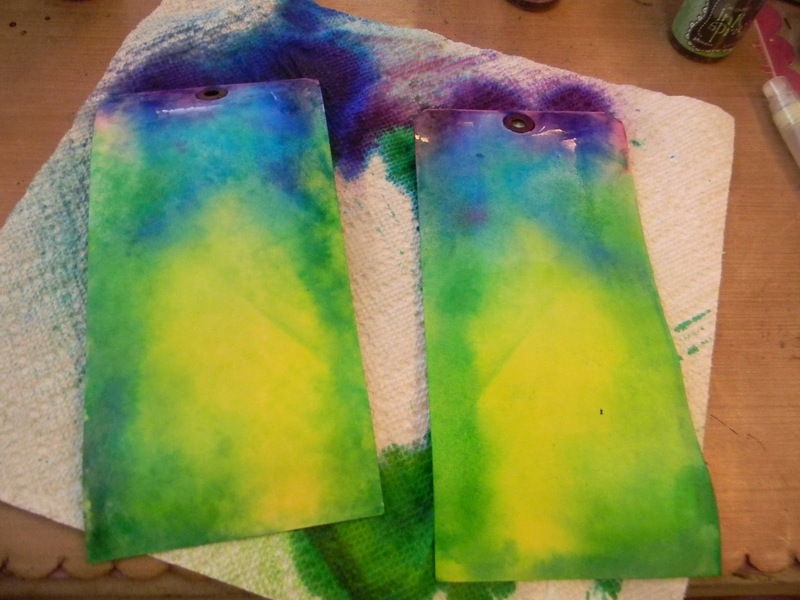 I sprayed my tag with water first then sprayed my colors. 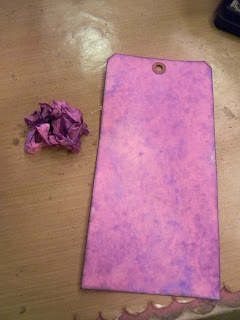 My tag was wet enough to do a kiss with another tag (oo-la-la), which worked perfect for my next step. 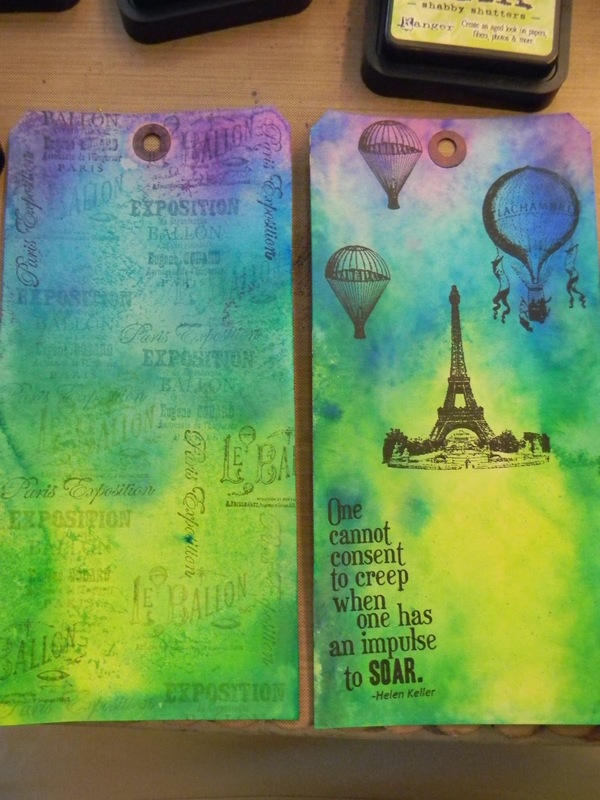 I used one tag to stamp my background images in coordinating Distress Ink, and one to stamp my AO images in Jet Black Archival. I will save the scraps for another project. I cut around my images and inked the edges of everything with Black Soot Distress Ink. I sprayed seam binding with the Dylusions and a little bit of water. 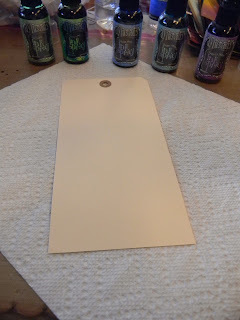 There was enough spray water mix that I dredged a tag through it for an awesome background to be used at another time...waste nothing! 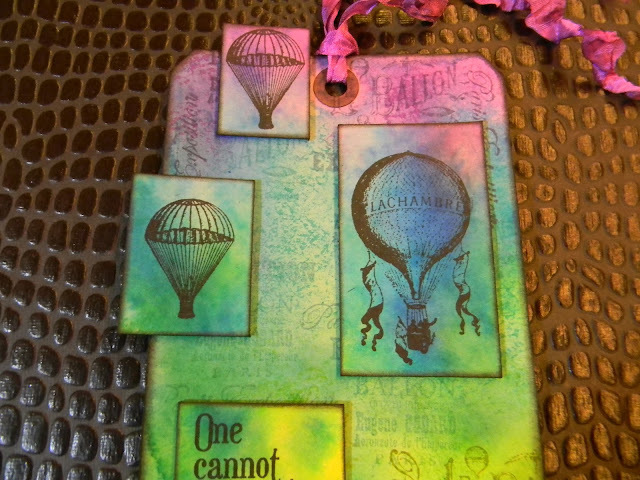 I am submitting this tag to Sarah's My Mojo Monthy for "tagology". Hi Anita! A beauty of a tag, indeed. Love the bright colors. Of course I love leopard shoes,too! LOL . Bravo! 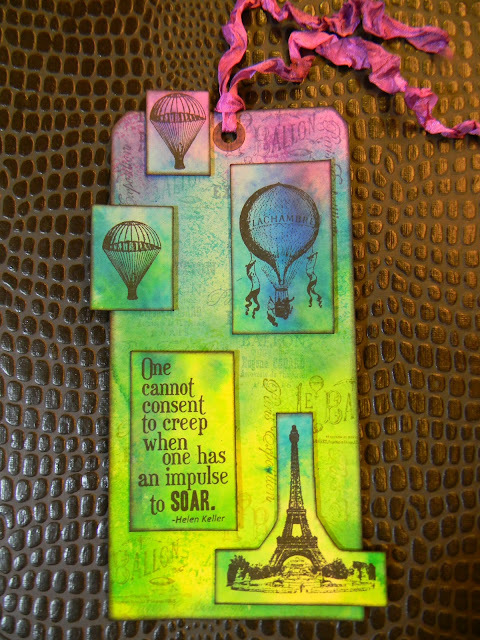 such a lively and colourful tag! 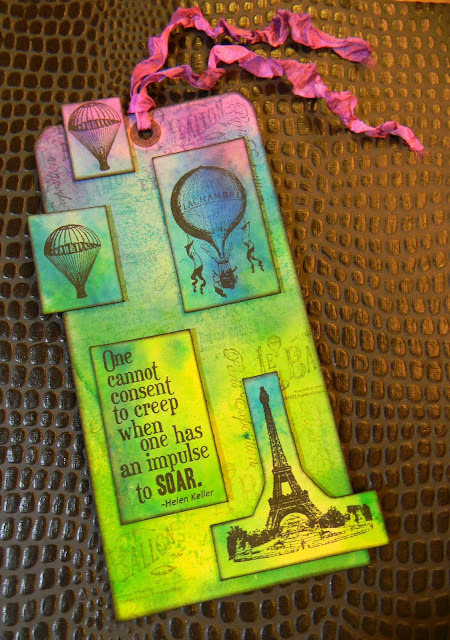 Love your combo of colours...the stamped cut-outs look fabulous and so does the binding. A great inky Tim tag there! Thanks so much for joining in with My Mojo Monthly...Sarah! Well you know how I feel about all things Dyan, so I LOVE this tag. Love the bright colors. And of course the brights go with a vintage-y stamp set. Love how you cut the images out of the extra tag. Gives the tag that extra pop! I LOVE this tag!! I know I have to get some Dylusions paints now! I love the ribbon and I have seam binding so thank you so much for the inspiration! What a super Tag this is Anita!! I love the colors you worked with. 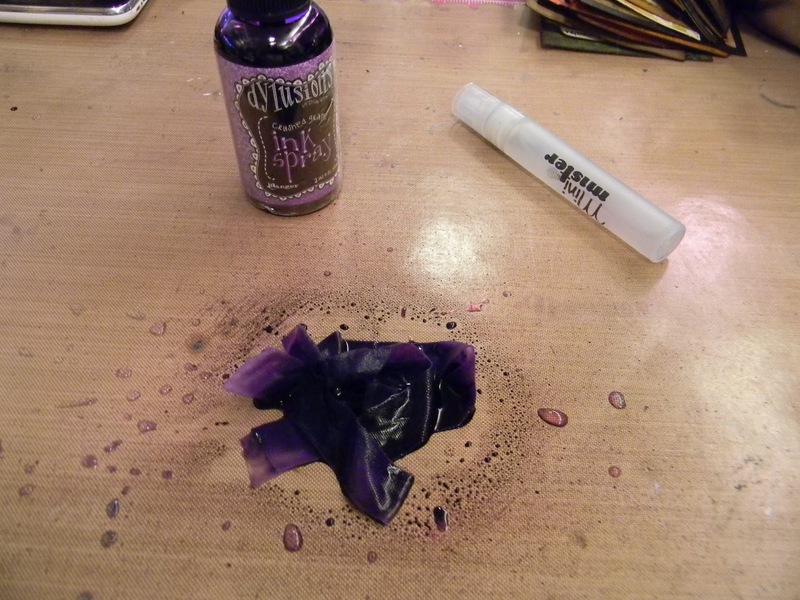 I finally bought my first bottle of Dylusions Ink Spray and wish I'd bought more, it's wonderful stuff!!! Crazy awesome colors! And your background....Love it! Its totally outside the box then everyone else. So fun! Love it! Wow, Anita, this is electric. Your color work is awesome, beautiful blending of the colors and fab use of the Dyan sprays! I am so glad you broke them out and demo'ed what could be done with them. Thanks for linking to my shop - hope people will check out the awesome prices on the Dyan sprays there! Love the brights colors! This tag is amazing! 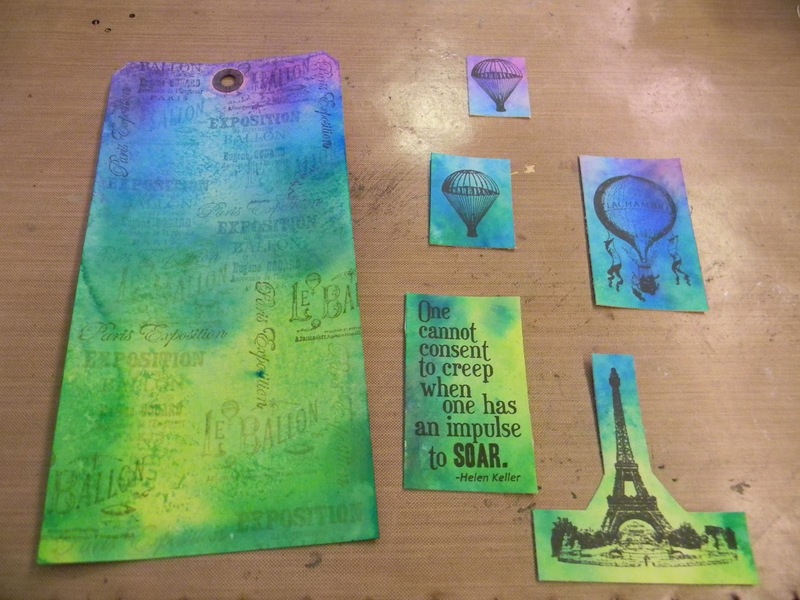 Amazing to see how beautiful our stamps can be done in "happy" colors! This brings a big smile to my face, I love what you did! Oh yum! I love the bright colors you chose for this too. Your tag is absolutely beautiful. Beautiful background colors! Love the effect! Sweet tag! Beautiful BG colors for the tag! Fab tutorial! Just For Mom X 2!!! The Hat Makes The Man!!! The Greatest Game Ever Played!? !